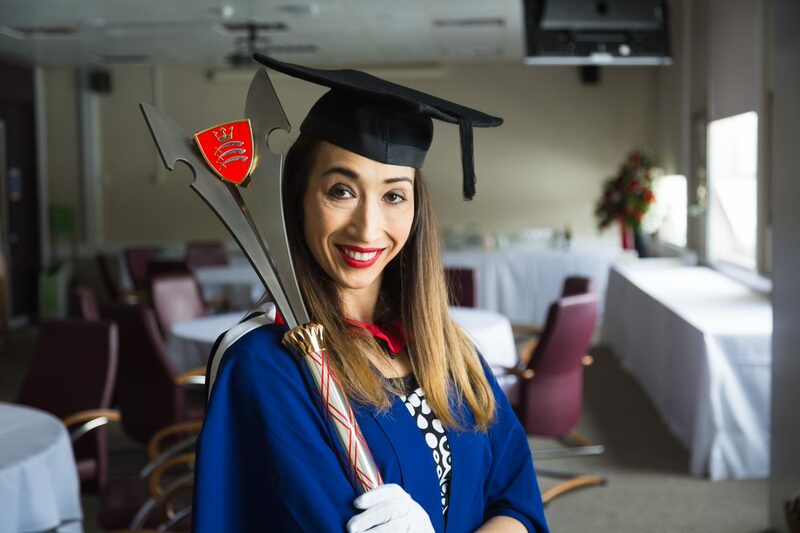 The first student to graduate from Middlesex University London this summer, Marissa Ward, who received a Master’s degree in Arts Management is pictured holding Middlesex’s first ever mace, specially commissioned for formal occasions. Marissa is a mature student and Middlesex BA Fine Arts alumnus who lives in Hillingdon. She praises the University as “a fantastic place to come and learn”, with an inclusive environment and teachers who were extremely supportive when she experienced family tragedy during her course. She volunteers at Chickenshed Theatre in Southgate and aspires to an arts career, possibly in venue management. The mace symbolises the right of universities bestowed by the Privy Council to grant higher degrees. It is carried at the back of the procession, in front of the Chancellor, and sits on a display stand for all to see during the ceremony. The mace’s designer, leading silversmith Richard Fox, studied at the University’s predecessor institution Hornsey School of Art and subsequently at the Royal College of Art, returning to Middlesex as an Associate Lecturer for seven years where he ran the first year silversmithing course in 3D design. He has produced work for Formula One, Rolls Royce, Garrard, Bulgari, Pernod Ricard, 10 Downing Street and Lambeth Palace, including a chalice presented by the Archbishop of Canterbury to the Pope. The 1.05 metre long, 5kg mace is made of Argentium, a silver alloy that is brighter than platinum and tarnish-resistant, first created at Middlesex in the 1990s by Fox's former technical tutor Peter Johns. Its design symbolises Middlesex’s history and evolution: three seax blades representing the County of Middlesex, a globe alluding to Middlesex’s international campuses in Dubai, Malta and Mauritius and intertwined ribbons recording the names of Middlesex’s predecessor colleges. University Chancellor Dame Janet Ritterman kindly donated the entire amount for the mace to be designed and created. “The mace should represent the depth of knowledge accessible across a global platform where Middlesex students can feel confident, strive to learn and thus enhance all aspects of life” says mace designer Richard Fox. The mace has three large seaxes with the University’s coat of arms between each one. The three blades are made from titanium. The crests are made using sterling silver, red enamel and 24 carat hard gold and are rhodium-plated. The crest has used as a symbol of the county of Middlesex back to Anglo–Saxon times. It represents courage and resourcefulness and is attributed to King Athelstan who used the design on a penny during his reign. The depictions of crowns are the earliest associated with an English sovereign. The staff of the mace has red enamelled intersecting ribbons on which the names of Middlesex’s predecessor colleges dating back to St Katherine’s College in 1878, and the University’s four campuses today are engraved. The ribbons illustrate the University’s coming together and growth as an institution. The top of the mace contains a domed globe representing Middlesex’s international reach with over 37,000 students worldwide across four campuses in London, Dubai, Mauritius and Malta, which are engraved around the collar of the globe. The sea is ornate blue enamel and the land is made using 24 carat hard gold plate. Encircling the globe is the inscription, ‘Middlesex University London’.